Imagine how challenging reading a book with the chapters out of order would be. Whereas reading a properly organized book gives a much higher understanding of the subject matter. Setting up your Business Intelligence (BI) solution with folders or “playlists,” sometimes referred to as “storyboards,” can organize reports and dashboards into a structured analysis. Putting proper thought into the order and content in the logical flow of analysis can be a play a huge role in a company’s ability to make world-class decisions. Without this structure, a company with hundreds of reports, often from different Enterprise Resource Planning (ERP), Customer Relationship Management (CRM) and data warehouse report writers that have different logins and user interfaces finds itself with no logical order or flow to analysis. This hardly empowers the average BI user and even worse, the solution often means manual compilation of the most important data in Excel or PowerPoint presentations, which misses the ability to drill down to detail that would otherwise quickly answers questions. Ideally, employees can access a single web portal accessible from anywhere, with organized playlists for different business areas, starting with big-picture items, then providing reports and dashboards with specific focus areas for detailed analysis. Below is an example of how a “playlist” can enable faster and better decision-making. This report quickly presents any business issue as represented by a Key Performance Indicator (KPI) by only showing KPIs where a given threshold is breached. The BI solution could then automatically distribute this as an “alert report” so that users do not need to repeatedly log in to a system in order to find exceptions. This first dashboard follows the KPI report, and the goal is to show graphical analysis with comparative and trend analysis for the first KPI (KPI 1) in the KPI report. This would be the first detailed report, such as a financial statement or a sales report, and the goal of the report is to provide numerical analysis for the first KPI 1, with drill down to underlying transactions. This second dashboard follows the KPI report, and the goal is to show graphical analysis with comparative and trend analysis for KPI 2 in the KPI report. This would be the second detailed report, such as a financial statement or a sales report, and thegoal of the report is to provide numerical analysis for KPI 2, with drill down to the underlying transactions. This third dashboard follows the KPI report, and the goal is to show graphical analysis with comparative and trend analysis for KPI 3 in the KPI report (see above). Of course, a user should be able to navigate the BI portal based on their ad-hoc analysis needs without following the suggested structure above. If used to its fullest potential, a reporting and analysis tool can automate busy work and present clear information for fast decision-making. The use of reporting playlists, for example, maximizes the functionality of a sophisticated BI tool. The playlist above describes a tangible application of reporting playlists and hopefully inspires other ideas of how your organization can use them. If you need assistance or help, Solver has a team of experienced professionals that can get your organization started in building the right template for you. 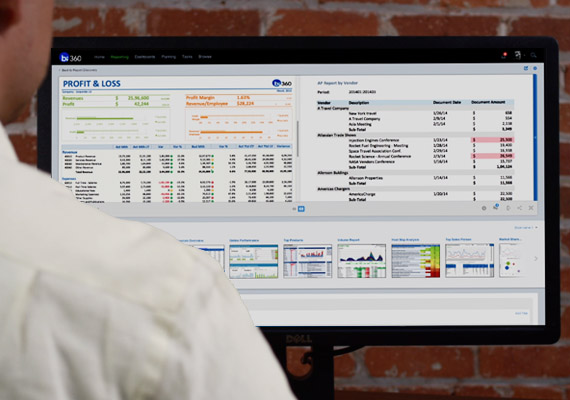 Solver enables world-class decisions with BI360, a leading web-based CPM suite made up of budgeting, reporting, dashboards, and data warehousing, delivered through a web portal. Solver is reinventing CPM with its next generation solution. BI360 empowers business users with modern features including innovative use of Excel in the model design process. If you’re interested in learning more, our team is excited to hear about your organizational needs and goals. This entry was posted in BI360, BI360 Reporting and tagged automated reporting, BI, bi suite, BI Tools, BI360 Dashboards, BI360 Reporting, business intelligence, Cloud, cloud cpm, corporate management software, CRM Reporting, dashboard, Dashboards, data warehouse, financial reporting, financial reporting software, KPI, operational reporting, report playlist, Report Writers, reporting tools, variance reporting by Sofia Iatarola. Bookmark the permalink.